Want silky straight human hair extensions that will stun? Then you’ve come to the right place. The I&K Pre Bonded Stick Tip Human Hair Extensions are second to none. 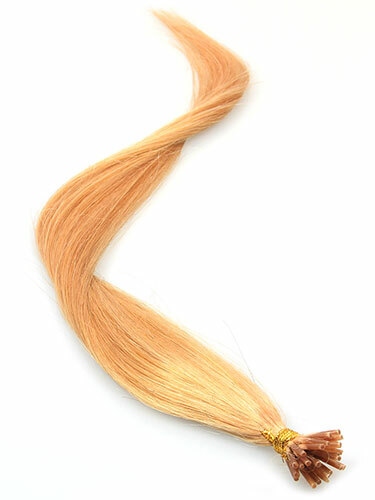 Not only are they made of 100% human hair, but they’re pre bonded for you too. Think extensions ruin your hair? Think again! The highest quality Keratin I&K use for the stick tip bonds couldn’t be kinder. Not only are they easy to apply, they’re easy to remove too - so you get the hair of your dreams while your natural hair stays healthy and happy. Whether you’re going for the dark and dangerous ‘do, or light and bright look, I&K will have the colour to match - even if you’re opting for ombre! Simply choose your shade, pick a length and you’re ready to rock. With length and volume just a few bonds away, the stick tip extensions are sure to wow. Glossy, silky, and oh so smooth, they naturally blend with your own hair for a fool-proof quick fix. Not bad.. but have had better else where..
#2 Lovely colour. Only thing i dont like is how thin they each strand of hair is. I know it states how much each strand weighs but I didn\'t think it would be THAT thin. I\'m gonna have to see what they look like in my hair. I think I may need more even though I ordered 150 strands. Which I usually do and always have some left over but I don\'t think I\'ll have any left over of these as they are pretty thin. So I recommend people with thick hair.. order more than 150!! I feel this product is very good quality hair considering it is non-remy. Initially HairTrade.com did send me two packs both marked colour '8' when clear to the eye the packs were totally different colours. I sent products back and HairTrade.com did correct this problem. I understand when buying hair extensions online it is difficult to get colours right first time. So I always keep good time before a fitting and buying the hair to allow time for delays or colour-related problems and would advise anybody else considering buying hair extensions online to do also. Overall a good value for money product and I would shop again! i absolutley love this hair it last so long and looks so real!! i would reccomend this hair to any one, ive been getting my hair done for about 6 years now and this is by far the best product i found for me .. I love this hair. I have bought from many websites that supply extensions, and Ive found that this hair is the easiest to look after. With the right conditioner this hair never knots (unlike many others out there). I live in Australia and the shipping is super fast. It never takes longer than a week to arrive!!! Fantastic hair, great shipping. The hair itself is actually great. It's the best and cheapest product so far. I have had the most expensive hair extensions you can buy .I started doing hair myself I tried different companies all which were ok but this is the best I have found the hair is tangle free stays very soft and shiny easy to style .I recommend buying the hair care products found on this website at least the daily moisturizer ph balancing mist. I will continue the purchase and refer to everyone .The price and quility are unbeatable. I`m not use this product, but i hope that will be good.